The IFA protest outside Glanbia. 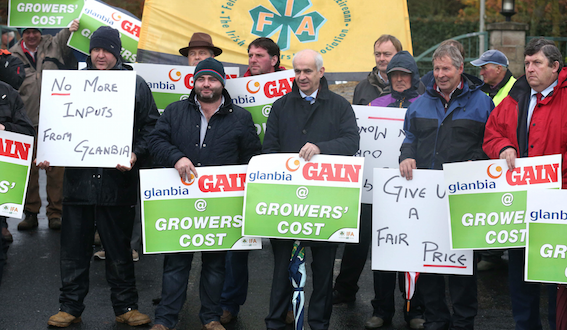 IFA grain farmers, led by IFA President Eddie Downey, held a protest outside Glanbia today (Monday), accusing the organisation of ‘short-changing hard pressed tillage farmers on feed grain prices’. Downey said the company’s price, which lags behind competitors across the industry, has vexed growers given the very difficult income situation they face after three consecutive years of poor market returns. He said that loyal Glanbia grain suppliers are extremely unhappy that their own shareholder funds are being used by the company to subvent the basic price paid for green grain this harvest. He said the shareholder fund was set up specifically to support growers through difficult periods when incomes are under pressure due to low commodity prices or other extreme events. “It was never envisaged that the fund would be used to subvent prices which are shy of the prevailing market price paid by others,” Downey said. 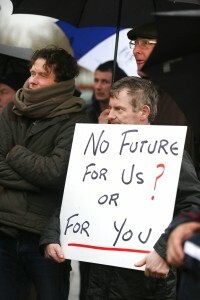 According to IFA Grain Chairman Liam Dunne growers have also been angered by a number of contract changes unilaterally imposed by Glanbia, including the imposition of cuts to the premium for Sturm contract oats (premium payable on 80% of delivered tonnes); changes to the bushel weight standard (moving from 52kph to 54kph); a further reduction of the premium of €10/t for gluten free oats and an insistence of a minimum field size of 20ac. Dunne said that Glanbia’s grain drying charges at €36/tonne are also well out of line with the norm and these costs are going to have to be reduced as part of ensuring that competitive forward selling grain opportunities are provided to growers. 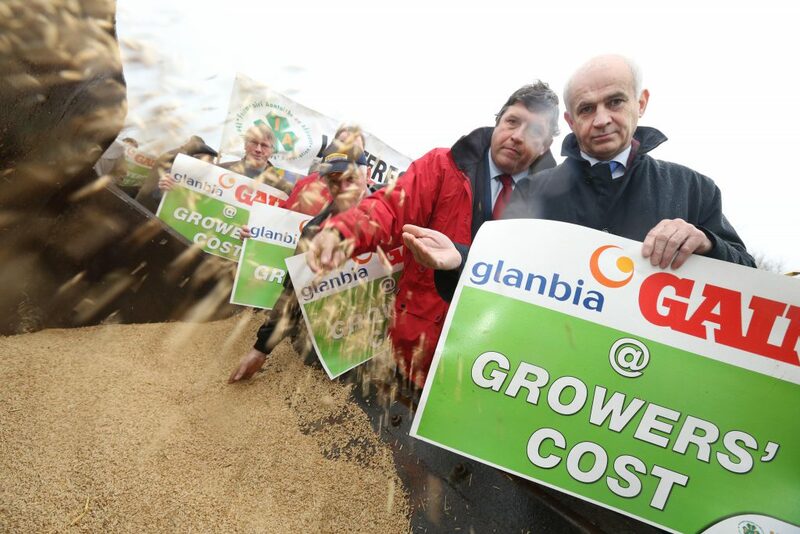 Responding to the protest at Glanbia House, the Chief Executive of Glanbia Agribusiness Colm Eustace said that he appreciated the challenging situation facing Irish grain growers after the third successive year of weak global grain markets. However, he strongly defended Glanbia’s grain prices, stating that the market prices set at harvest represented an optimistic view of the prevailing markets. “While our market prices have attracted considerable commentary, it should be acknowledged that over 40% of our total intake now attracts some level of premium or bonus; this is worth around €2m in total to growers compared to the equivalent non-contracted grains. Regarding the IFA’s comments on Oat contracts, Colm Eustace pointed out that Glanbia is the best oat buyer in the country, having paid €188 per tonne for Gluten Free Oats (plus free harvesting); €164/t for Standard Food Grade Oats; €140/t for Equine Oats and €120/t for un-contracted Feed Grade Oats. He pointed out that Glanbia also offers growers the opportunity to contract ‘dry and store’ their grain using Glanbia grain handling facilities.